40 of us met in the delightful setting of Woodbrooke College, Birmingham for a full and varied day of learning, reflection and fellowship. Rabbi Markus Lange gave us a wonderfully rich keynote address. His exploration of relating the concepts of hospitality to pastoral supervision was learned, gracious and thought-provoking; with hindsight, we could have done with more time to unpack some of the implications of what he said. But for many of us, it gave a new lens through which to perceive our encounters as supervisees and supervisors which we’ll carry with us into future sessions. I’ll leave it to other contributors to elaborate on the impact for them of what Markus had to say. There were 2 workshop slots, one in the morning and one in the afternoon, covering a range of topics. Guy Harrison and Ruth Craig shared their evolving findings and thoughts on their own doctoral studies and what these have to offer the development of good practice in pastoral supervision. Guy considered the links between pastoral care and psychotherapy, and how each can inform the practice of pastoral supervision. Ruth spoke of incorporating a contemplative model into the process of pastoral supervision. Michael Butler-Burns and Beau Stevenson offered workshops on different aspects of working with groups (bearing in mind that pastoral supervision seems increasingly to be taking place on a group basis): Michael on the transformational potential of groups working together as an entity; Beau on the nature of conflict within groups. Jane Leach provided a fascinating taste of how creative methods can enhance empathy and effectiveness in pastoral supervision. Duncan Strathie brought his experience in the Anglican church of improving standards of supervision for curates by incumbents; he emphasised the slow, steady cultural change which this entails, outlined the changes that had been achieved in southern English dioceses, and engaged participants in the reality of diverse parish situations. Throughout the day Tony Nolan ran a help-desk for any who had queries about the accreditation process. At the AGM we gave thanks and bade goodbye to Diane Clutterbuck as secretary and to Chris Shreeve as Apsical editor. There were no a.o.b items for the agenda, which gave time for some informal discussion. 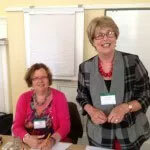 There seems to be a growing desire to connect at a more local level between the annual conference, and a couple of people have expressed an interest in co-ordinating a group in their area. The attempt to establish regional groups a couple of years ago never really took off, so the executive will be looking at the best way to carry this forward. There was also a suggestion that the timing of the conference be moved to September which would be a more accessible date for those working in education. This will be taken into consideration when booking next year’s conference. The accommodation worked better than last year in several respects. In particular the Cadbury Room, used as the main venue, was well located in the central building and spacious. The icing on the cake was the glorious weather! Lunchtime conversations were enhanced by sitting out on the terrace or strolling in the gardens in the sunshine. Feedback forms were generally very positive, with words such as “refreshing”, “stimulating” “encouraging” and “inspiring” featuring in the comments. There was a strong call to return to Woodbrooke next year.